By Al -- When Chrysler dropped the Minivan bomb on the American car buying public , other car makers were caught with their pants down. Other car makers had to resort to all sorts of stop gap, not ready for prime time vehicles to fill the void in their lineup. Some of the more interesting entries were from the Japanese car makers that hastily adapted their Japanese market cars for the USA. 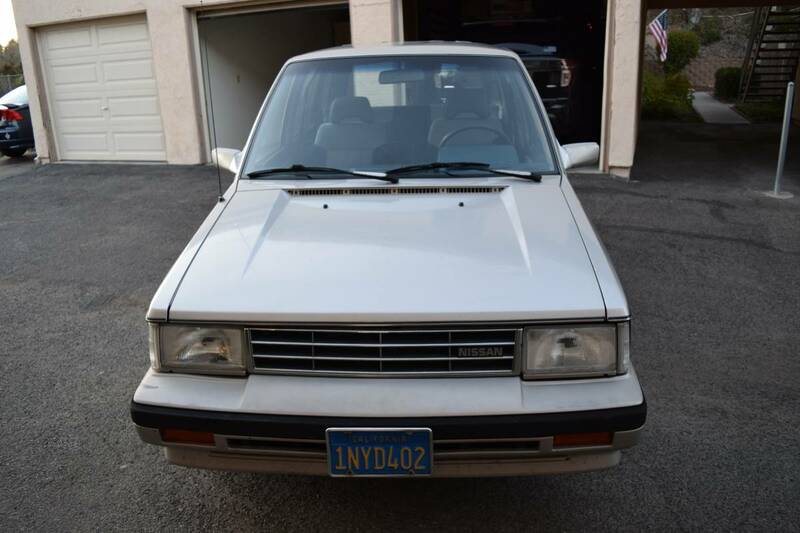 A perfect example is this 1986 Nissan Stanza Wagon 5 speed available for $2,800 in Oceanside, CA. There is no engine shot present, but Wiki and Autozone inform us that the car would probably have a 2.0L CA 20E throttle body injected engine with 105hp and 120 ft-lbs of torque. The little engine should be adequate for moving the little box along. The autozone site shows Timing Belts for $16 , brake rotors for $22 and alternators for $96 bucks. If the car had a carb…it would probably have a zillion brittle vacuum hoses, and it would definitely fall off my radar. There are several shots of the interior. 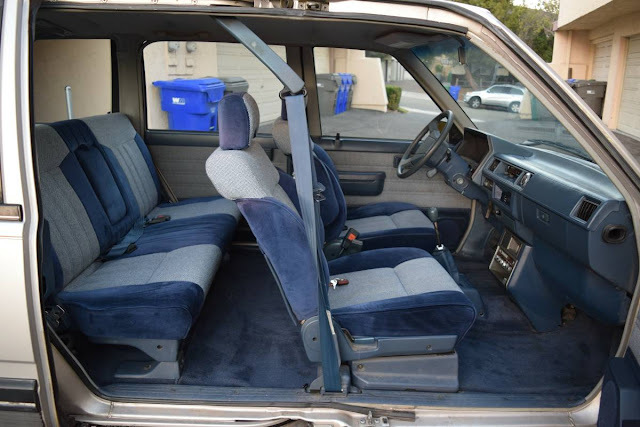 The interior looks like it is in beautiful shape with nice grey and blue fabric on all the seats. One of the shots shows the middle seat folded and shoved all the way up to the back of the rear seats. In a previous life I spent my weekends bicycling all over Southern California. I transported my bike inside my 1996 Subaru Wagon. I never liked mounting my bike on the outside of the car, because I just don’t like the thought of an expensive bike being out in the open for everyone to see. A little box like this would be perfect for bicycling. No mention is made of working AC, but if it doesn’t work, it probably wouldn’t cost too much to get it functional. 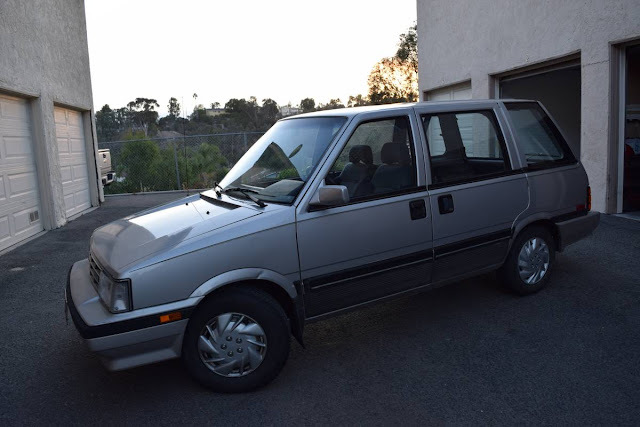 I have wanted one of these things for a long time….$3000 bucks is kind of pricey, but the owner claims only 83k miles, and overall it looks like it is in great shape. I really need to get rid of some of my cars, so I can make space for a little gem like this. 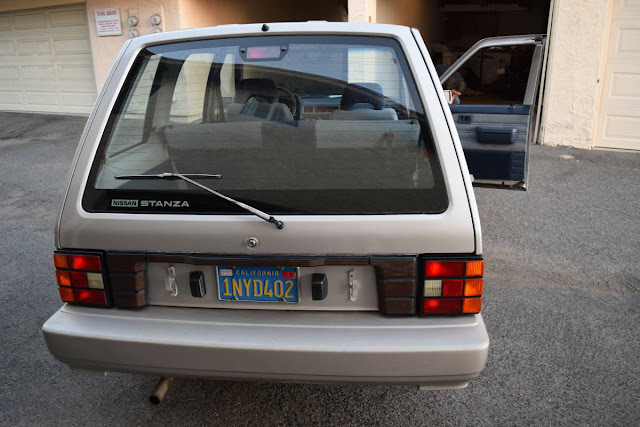 These were in that "wagovan" category that also included the Dodge Colt Vista, later Eagle Summit, and of course the Honda Civic Wagovan. Our family had a lightly used 4WD Colt Vista 5 speed and our closest friends had one of these Stanzas. As I recall it had folding jump seats in the way back, like a Discovery. These things worked when buyers (parents) cared more about function and frugality and less about image and impressiveness. My Sister had one same color she liked it but had bought it used she started to have some issues and got rid of it. My sister is very tough on cars, i have driven the colt version was pretty impressed with it @ the time you don't see them much these days. I had one of these through most of the 90s. Unbelievable utility, comfortable seating and ride, and slow as molasses. When you opened both sliding rear doors and both front doors it was was quite a sight. This car also came in a 4-wd version, believe it or not. People who worked on Nissans referred to these as "Wally Wagons" I think that is pretty self-explanatory. 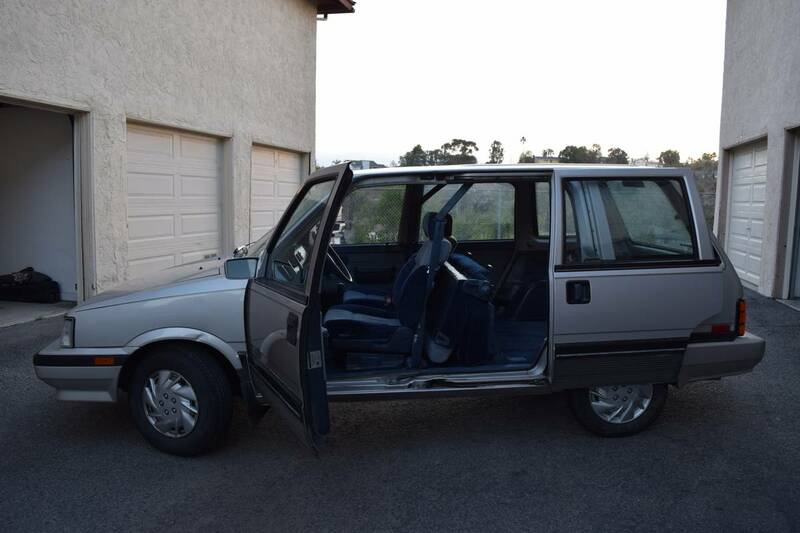 While they loved this car when they were little, later on it became the perfect vehicle for embarrassing my daughters when they became teenagers and needed me to pick them and their friends up from someplace. Classical music or opera on the radio would be the icing on the cake. Aside from all that, my Wally Wagon received way more unsolicited offers to buy it from me than any other vehicle I ever had - not even close. It happened in parking lots all the time.